On Line Registration for the 2018 SFA Convention ends on 11 June. Registrations after that will need to be accomplished in person at the Anchor Hotel, Wyndham El Paso Airport Hotel, in the North Corridor. or, Registration over the phone is available by calling Steve Franzoni, 915-433-4090, or Tom Melgares, 915-873-2183. 1900-2200 Depart 1730 - Green Beret Night at the El Paso Chihuahuas - AAA Baseball. For you prior 5th and 7th Special Forces Group guys attending the 2018 Convention, and anybody really, you may try the DELIight Restaurant in Downtown, El Paso. Close to where Green Beret Movie night at the historic Plaza Theatre, and Green Beret baseball night at the El Paso Chihuahuas game will be held. You won't be disappointed. Gourmet Soups, Salads and Sandwiches. El Salvadorans and Middle Eastern specialties, including Pupusas, Shawarmas, Falafel. 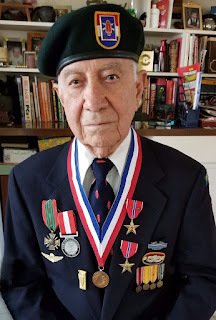 Initially Gutierrez joined the Army Air Corps specializing in parachute rigging, and that road led him to the First Special Service Force (FSSF). Gutierrez served with the First Special Service Force during World War II, storming the beaches in Anzio, Italy, liberating southern France, and reclaiming Rome from the Nazis. Under the command of Lt. Colonel Robert T. Frederick, the FSSF was made up of 900 American and 900 Canadian volunteers who assembled in Helena, Mont., to answer the call for men of the highest physical prowess to fight in an unknown unit at an unknown location for an unknown operation. The men were trained in commando tactics, that included mountain climbing, skiing, demolition, amphibious training and hand-to-hand combat, using the historic V42 knife for close-quarters fighting. Nicknamed the “Devil’s Brigade” by German Soldiers for their fierce tactics and practice of wearing black boot polish on their faces, the unit excelled during nighttime raids. One of the most famous missions was an amphibious assault landing in January 1944 at Anzio, Italy. The forerunners of today's Army Special Forces clawed their way through the siege of Monte Cassino and eventually captured Rome, before moving into southern France to encircle German troops. By the time the war ended, the brigade had accounted for more than 12,000 enemy casualties, captured more than 30,000 prisoners, won five U.S. campaign stars and eight Canadian battle honors, and, played a key role in the liberation of Rome, Italy from German forces. In total, Gutierrez saw 240 days of combat from December 1943 to December 1944. On December 4, 1944, the First Special Service Force was terminated because there was trouble finding replacements for such an elite unit and larger, division-size elements were needed to fight. After the war, Gutierrez returned to Texas, marrying his wife, Penny, in 1951; the two are still married after 66 years. Gutierrez went into teaching, and retired as a school principal in 1990. In 2015, Gutierrez and 41 other veterans of the famed U.S.-Canadian 1st Special Service Force were honored in the Capitol, Feb. 3, as recipients of the Congressional Gold Medal, the highest civilian award for distinguished achievement the U.S. Congress can bestow. "It's great to be here and it's great to be American," said the then 94-year-old Gutierrez. "I want to thank everyone who undertook this very important and noble assignment to honor and recognize this most versatile and effective World War II fighting unit from the USA and Canada." 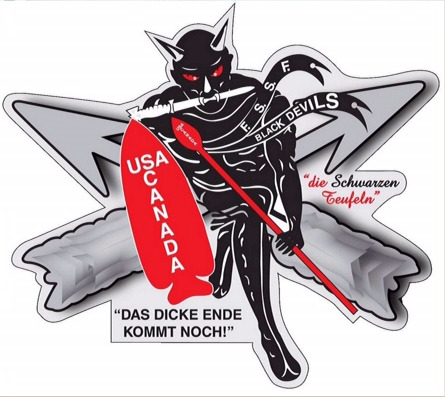 Gen. Joseph Votel, then commander of U.S. Special Operations Command, said "Gentlemen, the living members of the 1st Special Service Force, you should be proud of not only what you accomplished on the battlefield, but also for the foundation and groundwork that you laid in order to shape our modern day special operations forces and for the close and professional relationship that ties our two countries together, today. Rest assured that your legacy lives on in today's American and Canadian special operators -- both our countries and their citizens owe you a boundless debt of gratitude ... thank you." The 2018 SFA Convention Committee is now taking registrations for Vendor displays at the Wyndham El Paso Airport Hotel, the Convention Headquarters and anchor hotel. The cost for a table is $150 (per table). Please fill out and submit the request for Vendor Registration form below and the Convention Vendor Committee send the registration with contact phone numbers for the Convention Vendor Committee. Capt. Isaac “Ike” Camacho was born June 3, 1937 in the town of Fabens, Texas. At the age of 13, he moved to El Paso, Texas, where he graduated Thomas Jefferson High School in 1955. Upon graduation from high school, Camacho enlisted in the United States Army, taking his basic training at Fort Ord, Calif., followed by Infantry and Airborne School at Fort Campbell, Ky. Promoted to the rank of sergeant during his first enlistment, he became determined to make the Army his career. Volunteering for Special Forces he became qualified as a Special Forces weapons sergeant and was assigned to the 5th Special Forces Group (Airborne) at Fort Bragg, N.C. Deployed to Vietnam as a member of Detachment A-21, then Sgt. 1st Class Camacho was serving at the Civilian Irregular Defense Group (CIDG) Camp at Hiep Hoa when it came under attack by an estimated reinforced battalion of Viet Cong on the night of Nov. 22 1963. Taking the camp by complete surprise, the Viet Cong initiated their attack with withering automatic weapons and small-arms fire followed within seconds by an intense mortar barrage, pinning down the entire Vietnamese Strike Force inside the camp. Running from his sleeping area, Camacho maneuvered through a hail of bullets and shell fragments to man a mortar position. Calmly manning the position, he began to concentrate his fire on the Viet Cong that were attempting to breach the camp and remained in the mortar position until he was ordered to withdraw from the camp. In the subsequent confusion of the battle, Camacho was captured, along with three other members of the detachment. Following his capture, he was marched more than 150 kilometers to a prisoner of war camp near the Cambodian border, where he was held for 21 months either caged, shackled or chained to a tree. Remaining resolute and determined to escape, he made good his escape on the night of July 9, 1965. Using the cover of a monsoon rain, he slipped through the bars of his cage, which was less than 25 feet from his guard, and slipped into the jungle, evading capture for four days although suffering from starvation, malnutrition and disease. Finally finding his way to an Army of the Republic of Vietnam (ARVN) outpost, he was repatriated to the United States, where then Master Sergeant Camacho was debriefed on his ordeal and received accolades from President Lyndon B. Johnson as the first American serviceman to escape from a POW camp in Vietnam. Receiving a field commission to the rank of captain and after completing the Infantry Officer Basic Course, Cap. Camacho returned to duty with the Special Forces, serving with the 1st Special Forces Group (Airborne) and subsequently was assigned to Fort Bliss, Texas, where he retired following his service as the commander of the Fort Bliss Stockade. Capt. Camacho’s awards and decorations include the Distinguished Service Cross, Silver Star Medal (1 Oak Leaf Cluster), Bronze Star Meal, Purple Heart Medal (1 Oak Leaf Cluster), Meritorious Service Medal, Army Commendation Medal (2 Oak Leaf Clusters), the Prisoner of War Medal, the Combat Infantryman’s Badge, the Master Parachutists Badge, Vietnamese Ranger Badge and the Vietnamese Parachutist Badge. In retirement, Camacho entered the U.S. Postal Service, attaining the position of station manager, and retiring with more than 20 years of service. The El Paso Chapter of the Special Forces Association has been named the “Isaac Camacho Chapter.” He is married to the beautiful Gracie Camacho, and has two sons. A longer article on Ike can be found at the History Net. Fill out this form, select "continue" then confirm and we will send you by e-mail, a printable SFA 2018 National Convention Registration form that you can mail to us. This is the on-line registration form. After completing and submitting you must go to the on-line payment site accessible via the icon on the right hand side of the web page.